The Rocky training montage is an iconic moment in film history that's resonated across genres for decades, making it a required tangent for every subsequent Rocky movie. But Philly Post writer Dan McQuade likes the Rocky II montage the best because of the nonsensical running route Rocky Balboa takes across the city. McQuade used the USA Track And Field distance-measuring tool to chart a hypothetical route that Rocky could have taken to hit every photogenic location around Philadelphia—all in a single run where a bunch of fans join him along the way. 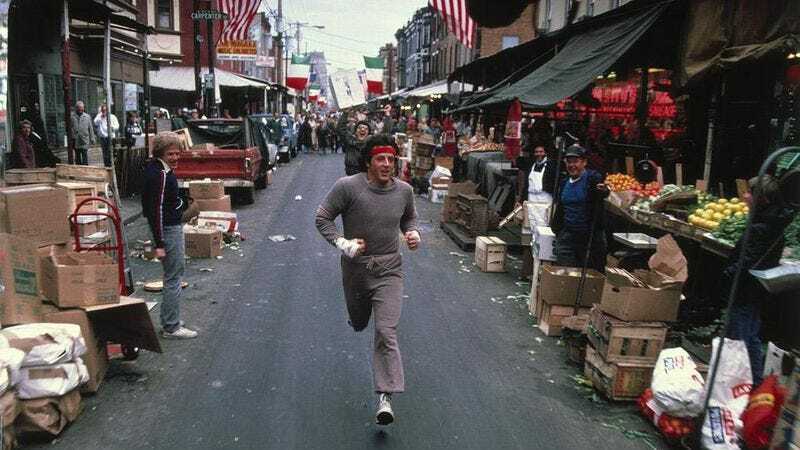 And by McQuade's estimates, from where Rocky starts in the Girard Estates area of South Philadelphia, to the Italian market, to Kelly Drive, to Independence Hall, and up the Art Museum steps—and every location in between—Rocky would’ve logged over 30 miles in a single run. Since it’s a montage, it doesn’t necessarily mean that Rocky ran a 50K in one day. But based on the tape and McQuade’s route reconstruction, it’s a wonder Rocky could even stand up in the ring.